The SilverStone Raven RV04 is, to put it mildly, long overdue. 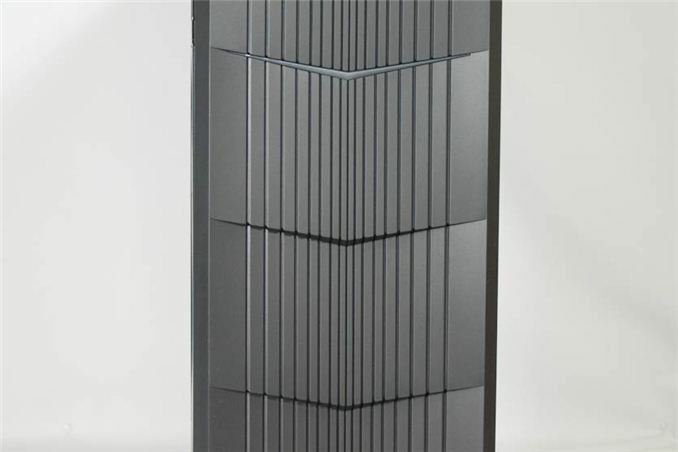 While announcements about its existence date back to just over a year, I can tell you this case has been in development since not long after SilverStone released their remarkably strong Temjin TJ08-E. That case's stellar performance surprised even SilverStone; I'm reasonably certain they thought the Fortress FT03 was going to be their strongest Micro-ATX enclosure for some time to come, but the TJ08-E changed the game. After I reviewed it, I asked them directly for an ATX version and received the kind of cagey answer I ultimately wanted to hear. Unfortunately, the journey of the full-sized TJ08-E descendant has been more than a little fraught. It's my understanding that tooling problems, among other things, have led to lengthy delays. In fact even the Raven RV04 will be showing up late on American shores; we'll likely actually get the high end version of this chassis, the Fortress FT04, first. The design has a lot to live up to. SilverStone's Fortress FT02 has practically been the gold standard for air cooling for some time now, and they posit that the FT04 is actually capable of producing even better performance. Part of the reason they have this confidence is because they seem to understand a vital truth about cases and cooling that many of their contemporaries still grapple with: nothing cools better than a direct line of airflow through the CPU cooler. The rotated motherboard and convection cooling was never the magic that made the FT02 and previous Ravens work; it was good marketing and seemed sound, but the reason those cases were so good at their jobs was the fact that they had giant fans blowing directly through the CPU tower coolers. 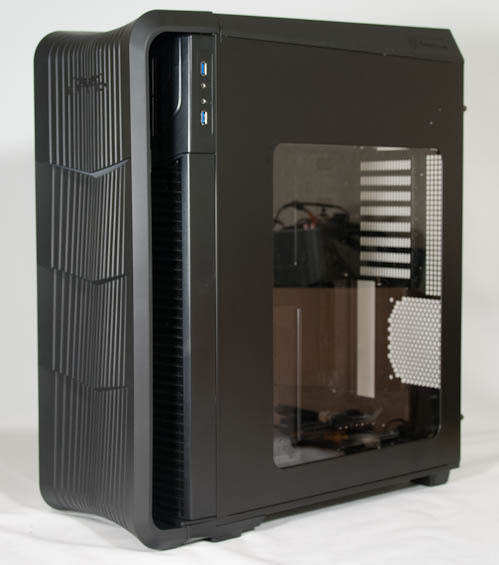 Air wasn't moving at an angle like it does in traditional ATX cases. Drive Bays External 2x 5.25"
Internal 7x 3.5", 4x 2.5"
Dimensions 8.62" x 22.87" x 19.57"
The Raven RV04 is, in true SilverStone fashion, kind of an oddball. But it's an oddball even by SilverStone standards. What should strike you immediately is the fact that they don't include a 120mm exhaust fan by default, flying in the face of conventional wisdom. This is something actually covered in their press material; by not including the 120mm exhaust fan, they're able to let the extant front intake fans to channel air directly from front to back. The flow of air inside the RV04 winds up being defined almost entirely by the coolers used on the processor and graphics card(s). Ordinarily I pay even less attention to PR than you do, but SilverStone's is usually pretty on the money, and without spoiling too much I can tell you that I definitely didn't miss the exhaust fan. ditch the hard drive cage and it looks as though it could accomodate a 2x180 radiator at the front (that is the equivalent of 4.5x120 radiator so enough for most rigs!!) although you might lose a 5.25 bay as well. The FT04 doesn't look quite as nice in photos as the FT02, but that's forgivable if it has good fit and finish and performs well. It looks like the performance is definitely there (the RV04 has basically the same case body and same ventilation), but I hope that SilverStone hasn't let their fit and finish slip too much on the premium Fortress line. I'm not sure I would put as much emphasis on ease of assembly as you generally do in your reviews. Remember that even though you as a reviewer have to assemble these things every week, most users (even enthusiasts) will often be leaving the case closed for months on end. You probably won't spend even 1 hour of assembly time for every 100 hours of actual use. I'd prefer a case with excellent thermals, acoustics, and fit+finish, even if it was a nightmare to put together. Of course, all else being equal, easier assembly is preferable. I just wouldn't sacrifice too much to get it. SilverStone's literature mentions support brackets for the CPU and video card on the RV04. Did you get a chance to test these? I know I often feel nervous about giant-size CPU heatsinks, so some mechanical support would be much appreciated. Same for the extra-long video cards which tend to sag in their normal tower orientation. interesting results, but as pointed out in the article this looks like the appetizer before the real dish. looking forward to a review of the FT04, but also a comparison to the recently released Corsair Air. I don't see why this is praised as the best air cooling. The RV03 had the same two 180mm, but at the bottom and a 120mm at the top. And the orientation was such that the 180 was below the CPU cooler and the 120mm was above it. Perfect thermodynamic flow. Math wise, that is a much better setup then a 180mm a long way away, possible going through a HDDs shooting towards a CPU without anything on the other end. Well, I'd rather have specialization than every single case out there trying to hit every bullet point possible and cover all the bases, if it means better performance or lower price. Nothing wrong with a good air cooling case without water cooling aspirations and vice versa.